ALZip's purpose can be described quite easily. It can be used to extract contents from almost any kind of archive out there. The application is capable of handling countless archive formats, from popular ones, like ZIP or RAR to lesser known ones, like TAR or TGZ. What's more, the application is remarkably easy to use, thanks to its drag-and-drop functionality. It is compatible with all popular Mac OS X versions and it can be made operational in just a few seconds. The application displays a small floating box on the screen, on which you can simply drop an archive file, to extract its contents. It doesn't take long to extract files from an archive and the application's neat animations will make this a comfortable process. By default, the extracted contents will be stored in the same folder as the source archive. Alternatively, you can set the application to ask you for an output folder or to store the extracted files in a specific folder at all times. In addition, ALZip can either show a results window, when it is done extracting or open the output folder automatically. It is also possible to associate ALZip with certain archive formats, so you don't have to run the application each time you wish to extract files from those archive types. 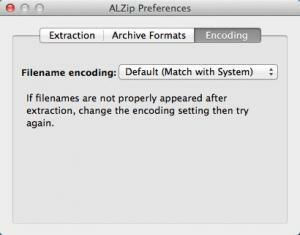 With ALZip on your Mac, you will be able to extract data from almost any type of archive. You can extract data from mostly any archive type. You only need to drag and drop an archive to extract its contents. The application is lightweight, it works fast and it is quite comfortable. You can only extract files with ALZip. You can't create new archives. You can download ALZip free here.